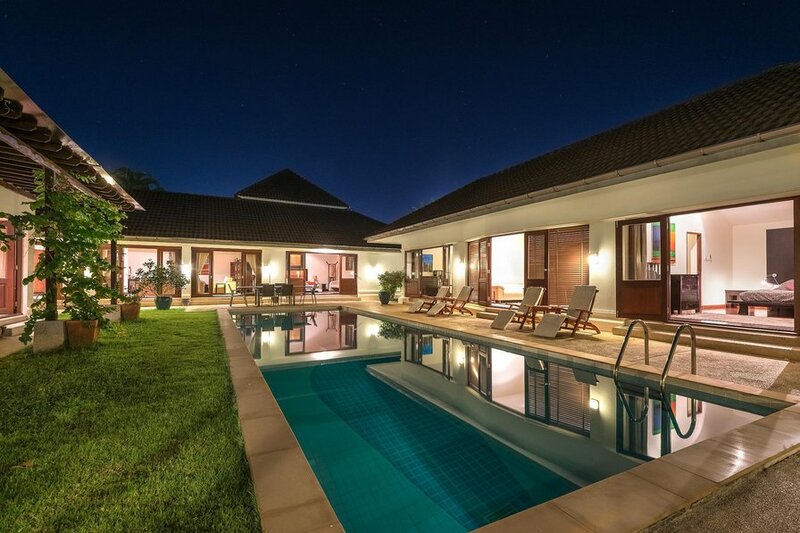 Large luxury garden villa with 4-5 bedrooms set in its own lush garden surrounding 12m pool. With full western kitchen and dining table. 250 TV channels and dedicated Wi-Fi so you can keep in touch! Relax around the pool, do some laps, then play a round of golf while the kids spend the day at the wakeboard lake. In the evening use the BBQ or get an exotic take-away from the local market. This villa is equipped for our own family use, so it is well-equipped and comfortable for groups of up to 10. There are two living-rooms, so you can have privacy - and not fight over the TVs. We have 3 main bedrooms with king bed plus a pool living-room with double sofabed and a small bedroom with bunks. This is a very cool villa if you want comfort, space and peace in luxury surroundings. The pool is designed for swimming as well as lazing - it is 12m long, rectangular and 5' to 7' deep with a saline filter system, so no red eyes if you stay in it all day - or all night! There is a large stainless BBQ, teak pool loungers and a 10-seater garden dining table. With wireless broadband you can relax and stay in touch at the same time. We have streaming TV giving you 250 channels - all the UK TV plus Sky and BT Sports plus Russian, French and German channels PLUS free movies and TV series.